After a full night of Halloween fun, the boys and I needed some chill time at home. But to keep them busy, I used the fun “pumpkin brains” from our pumpkin carving efforts to create a slimy sensory experience. A bowl and a colander later I was in business. Basically dump the “pumpkin brains” into a bowl. Add a bunch of water. Set a colander or another bowl next to it. And, let your little one go to town. B spent forty minutes enjoying the slime. Afterwards, we made some roasted pumpkin seeds. Want to try our recipe – check here. 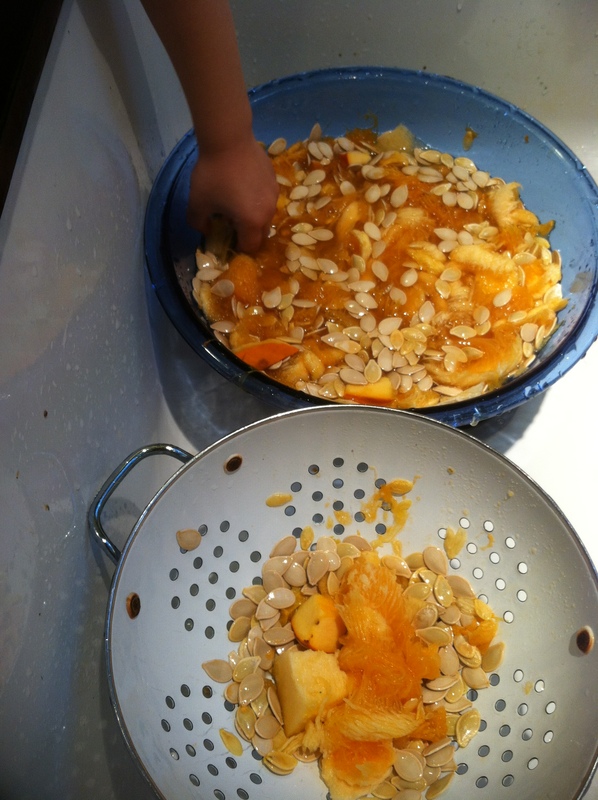 This entry was posted in activities, rainy day fun, recipe and tagged Halloween, Holidays, Jack'o Lantern, Pepita, Pumpkin, Roasted Pumpkin Seeds, Sheet pan, Shopping on November 1, 2013 by Modern Mama.